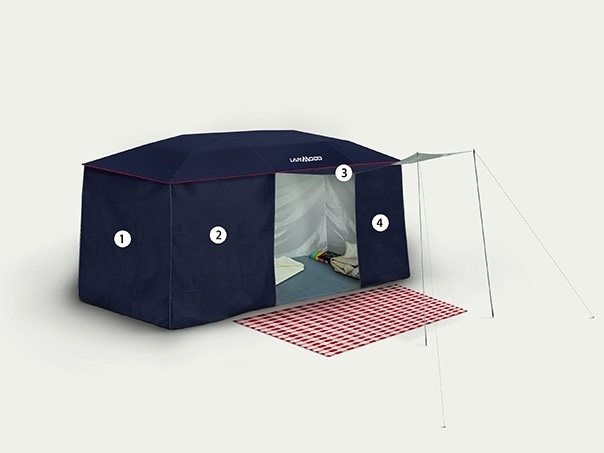 This purchase page is only for Lanmodo automatic type tent. Before placing order here, please make sure you already got Car Tent and Stand. These 8 side canopies just for those customers who already got Car Tent and Stand but want to upgrade to All-in-One unit. Take out all 8 side canopies and find the correct position for each side canopy (There are markers on each canopy, please follow the image below). Unlock the buckles on car tent and fix side canopies on car tent by buttoning up double-buckles one by one. Pulling up zippers to combine together side canopies. If needed, use 2 tent poles to leave a door for your camping tent. If needed, use ropes and pegs to strengthen it.